To me jambalaya is a fall or winter dish. I am always nervous or fidgety when LSU or the Saint’s or playing, so you might find me cooking Jambalaya while watching the game on TV to help me relax. It’s also fun to cook while sucking down a few beers at tailgate parties. This is my newest jambalaya recipe. I call it creole because it includes tomatoes and a more complex seasoning mix which contains thyme, oregano, and allspice. Sometimes I include shrimp, but I’ll save that for another post. If you don’t wish to make the seasoning mix, a store bought brand like Tony’s or Slap Your Mama will substitute just fine. I make my own seasoning for just about all my cooking because I believe it gives me more control of the flavors. Seasonings in a dish should be to your liking so feel free to tweak my recipe. 1.5 cups of rice – converted rice such as Uncle Bens works best. If you use regular rice rinse it. For this dish you’ll need a large pot. I used my number 12 black iron pot which is about 12” across with 5” sides. If you have a smaller pot, reduce the meat to ½ pound portions. Heat the oil in the pot and brown the andouille sausage, stirring slowly with a long wooden spoon or a spade. While this is browning, go ahead and season the chicken thighs and pork chunks with about a tablespoon of the seasoning mix. Once the sausage is browned remove and set aside. Add the pork chunks to the pot, stirring, and cook until is becomes slightly seared, about 5 minutes. After 30 minutes turn off the stove (or remove from oven) and remove the lid from the pot. Stir well, and then fold in the green onions and parsley. There will likely be about a ½ inch of liquid on top when you first remove the lid. Return the lid and let it rest for an additional 10 minutes. Remove the lid, fluff the jambalaya and serve. 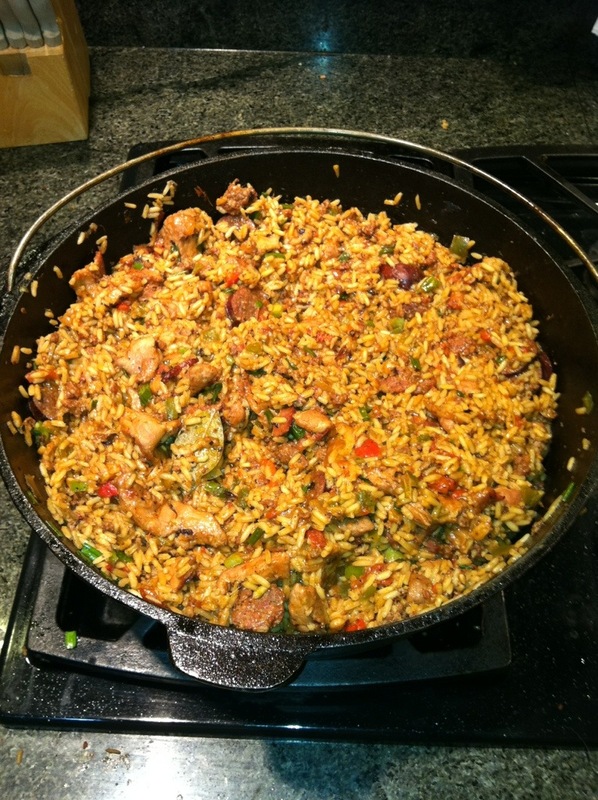 Sometimes when a jambalaya is opened at the 30 minute mark there is too much water or more likely, the rice is crunchy. Don’t freak out. These problems are caused by an incorrect liquid to rice ratio. For crunchy rice stir in a cup more water and let it sit covered for 15 minutes. For too watery, remove the lid and let it sit for 15 more minutes.